Cool off in our shaded swimming pool or relax back on a sun lounge. Mum and Dad can cook a BBQ in the adjacent camp kitchen while kids play in the pool. Entertain the children at our all ages playground which features modern funky monkey bars. Camper’s kitchen: Located beside the pool is our social camp kitchen where you’ll find dining facilities, free to use gas BBQs, stovetop, microwave, kettle, toaster, fridges and flat screen TV. A unique feature of the park is our immaculately maintained international sized grass bowling green for all guests staying in the park to use. Equipment is available for hire from reception and green fees apply. Daily competitions are held from May to August with great prizes.There is also 4 day carnivals in June, July and August. Please see our “NEWS” tab and Park Events schedule for dates of our bowling events. During the off season, you can roll up at your leisure. This is a great activity for all of the family. Kiosk: In our reception you will be welcomed by friendly staff who can assist with tourist information, a back–in service for your caravan or camper, free WIFI tokens, free book ahead service to other Top Parks of Australia, Wintersun merchandise including hats, t-shirts and stubby holders, LPG refills, ice, locally made icecreams such as chocolate coated bananas and mangoes, tour bookings (Coral Coast Helicopter tours) and park events and seasonal fruit and vegetables (subject to availability). Holiday with your pet all year round: Wintersun welcomes pets on all camping sites and designated accommodation at the managers’ discretion. Let your pets run free in our new off leash pet area. For more information please visit our “Travelling with pets” tab. 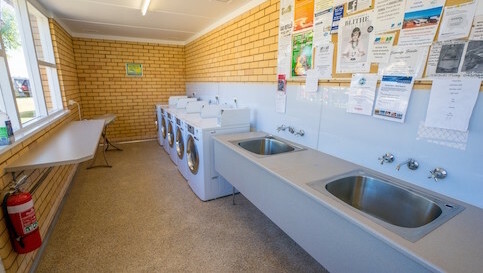 Modern laundry facilities: The laundry in the main amenities block is newly renovated and features brand new front loader washing machines and dryers. There is lots of clothes lines available for you to hang your clothes in the beautiful Carnarvon sunshine. There is long benches for the folding of clothes as well as irons and ironing boards. Disabled bathroom: Our refurbished disabled bathroom enables wheelchair access and has a shower chair, non-slip flooring, hand held shower head and rails. A $10 deposit is required at reception for a key to access this bathroom. Keep in touch with loved ones with our free WIFI service. Please ask for a token at reception. The washing of cars and caravans is permitted on grassy sites for a fee. Please enquire at reception. We encourage all fisherman to clean their catch at the new boat ramp in town. For smaller catches we have stainless steel benches for fish cleaning at the rear of our park. Please wrap all fish offal in newspaper and secure it in plastic bags before disposing of in our designated fish cleaning bin. Fish cleaning is not permitted on camping sites or in chalet accommodation. For your convenience we have a dump point at the rear of our park. Please only use our facility if you use eco-friendly products in your toilet. An alternative dump point is located on Hill Street in the town centre.